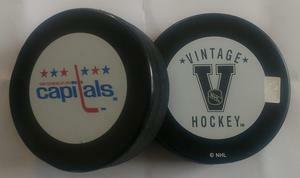 Along with the Kansas City Scouts, the Capitals joined the NHL as an expansion team for the 1974-75 season. With a combined 30 teams between the NHL and the rival World Hockey Association, the talent pool available to stock the new teams was extremely thin. In their first season, the Capitals would set an NHL record for futility, losing 67 of 80 games, and only winning one on the road. The Scouts fared only marginally better, and the expansion was widely seen as having been a mistake. The team did not fare much better through the rest of the 1970s and early 80's. By the summer of 1982, there was serious talk of the team moving out of D.C., and a "Save the Caps" campaign was underway.